Welcome to this free copywriting course! This 25 minute course is for complete newbies who barely know what “copywriting” is. 🤚🏼 Block out about 32 minutes to watch these training videos. ✏️ Grab a pen and paper and take notes. 📄 Send this page to a friend or colleague who needs some help learning copywriting. VIDEO 1: What is Copywriting?! Copywriting permeates everything you do. Your emails, your webpages, your videos….all your communication. By using some psychology and formulas, you can increase the response rate you get for everything. That’s why copy is one of the bedrocks of marketing. Knowing how to write high-converting copy will put you ahead of 90% of people in the workforce. Further Explanation: What is copywriting, a visual guide. VIDEO 2: The difference between selling and educating. Let’s change your mindset about “selling” right now. Trying to sell too hard is the single biggest rookie mistake people make. Let’s learn how to still sell hard…..without annoying people and making them leave. The AIDA formula is unbelievably powerful as your can see. 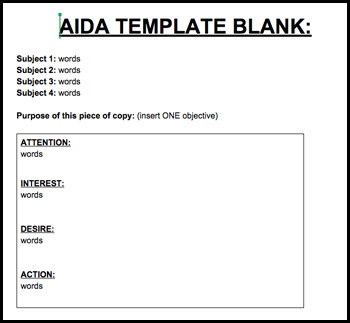 Here’s the blank template I use for every piece of copy I write. Even when I show huge companies how to write, this is what they learn. VIDEO 4: Write like you talk….not like your English class teacher. Talking casual almost always outperforms professional speak. Unless you’re purposely trying to confuse your customer (like bank fine print or lawyers documents), then speak in a so-easy-to-under-stand manner. VIDEO 5: Write what appeals to your customers…and how to find it. If you want to make articles that are ASSETS in the future, you’ve gotta write about things people want to hear about. Not just random blog posts. We’re going to train some dogs in this video…..
VIDEO 6: Features VS Benefits. 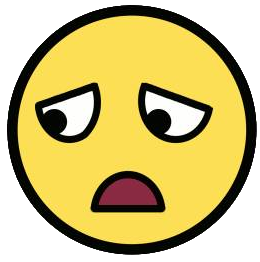 Let’s say you’ve only got 45 minutes to write a piece of copy…..
….and you have no clue what to do. Yikes. If you don’t have time to figure everything out yourself, then download this guide and follow along step-by-step. 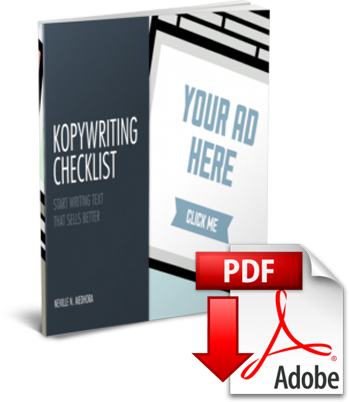 It’s called The Kopywriting Checklist and it’s a paid product we’ve sold over $75,000 of on AppSumo. Make sure to keep this handy PDF document on your desktop. Whenever you have a piece of copy to write, quickly read through it. It’s meant to be super-short and quick to follow. My full list of copywriting books. Oh no! Our time together is done! I sincerely hope you learned something new during this mini copywriting crash course! Just remember: Even if you took away only ONE change to your writing that improves it by even 10%…..think of the impact it’ll have over your entire career. If you would like to keep learning, upgrade to The Kopywriting Kourse to get god-like at copy. The full course is for people who want to dive much deeper into copywriting. The KopywritingKourse is a multi-part course designed to take you through all the mental tricks, hacks and formulas I use to develop high-selling copy. You also get weekly office hours where you get live help. This is the closest thing you get to sitting by my side and getting a lesson in copywriting. Click here to see the full details of the KopywritingKourse. This Kourse is used by individual business owners, up to publicly traded companies in sales departments (really). If you would like to hone your copywriting skills so you can sell EVERYTHING better, this is a fantastic investment. Also, every time there’s new sections or updates, you get them all for free. Sign up for my newsletter to get weekly insider tips to learn how to become a good SUPERHERO writer. P.S. This was just a super basic into to copywriting! If you’d like more advanced techniques, and even weekly live office hours to get help with your own copywriting projects, consider joining the premium Kopywriting Kourse here!